Algebra 1 is part of the Essential Pre-College Math (EPM) series of 16 self-paced, online modules that cover topics ranging from basic number properties to factoring and graphing polynomials. The modules are designed to help students review or master content usually covered in Pre-Algebra and Algebra I courses taught in high school, while at the same time presenting the material with authentic examples illustrating how mathematics is used in the various fields of study related to work for architectural engineering technicians or construction. The self-paced, modular structure of the modules allows students to work on their areas of weakness without requiring them to spend time on material they have already mastered. This course underwent a thorough review by subject matter experts. Students will use the properties of equality and real numbers to solve first-degree equations, inequalities, and absolute values. Beginning Algebra Module 1: First Degree Equations and Inequalities with One Variable, consists of 2 assessments, an introduction, and 5 sections: Pre-Assessment, Beginning Algebra Module 1 Introduction, Section 1: Real Numbers, Section 2: The Addition and Multiplication Properties of Equality and Equations, Section 3: Inequalities, Section 4: Absolute Value and Inequalities, Section 5: Translating from Word Statements to Mathematical Statements, Post-Assessment. Students will graph solutions to linear equations on a plane and develop equations from points and slope. 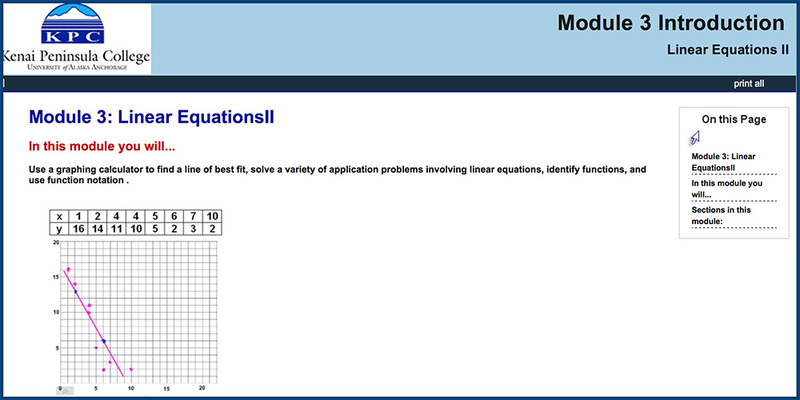 Beginning Algebra Module 2: Linear Equations I includes: Pre-Assessment, Introduction: Linear Equations I, Section 1: The Rectangular Coordinate system, Section 2: Graphs of Straight Lines, Section 3: Slope, Section 4: Forms of Linear Equations, Post-Assessment. Students will use a graphing calculator to find a line of best fit, solve a variety of application problems involving linear equations, identify functions, and use function notation. The module includes: Pre-Assessment, Module 3 Introduction, Section 1: Introduction to Linear Regression, Section 2: Introduction to Applications Involving Linear Equations, Section 3: Introduction to Linear Functions, Post-Assessment. Students will solve systems of linear equations and inequalities in two variables using a variety of methods. Module includes: Pre-Assessment, Introduction: Systems of Linear Equations and Inequalities in Two Variables, Section1: Solving Systems of Linear Equations, Section 2: Solving Systems of Linear Equations by Substitution Method, Section 3: Solving Systems of Linear Equations by Elimination Method, Section 4: Graphing Systems of Linear Inequalities, Post-Assessment. Students will manipulate variable expressions using properties of real numbers and rules of exponentiation. Module includes: Pre-Assessment, Introduction: Variable Expression I, Section 1: Review of Real Number Properties, Section 2: Variable Expressions, Section 3: Polynomial Functions, Section 4: Exponentiation Rules, Post-Assessment. Students will manipulate variable expressions using properties of real numbers and rules of exponentiation and use techniques to solve polynomial functions. The module includes: Pre-Assessment, Module 6 Introduction: Variable Expression II, Section 1: Multiplication 1, Section 2: Multiplication 2, Section 3: Division with Polynomials, Section 4: Polynomials in Multi-Variables, Section 5: Algebra of Functions, Post-Assessment. Students will successfully factor second and third degree expressions using general factoring techniques and will use the zero factor property rule to solve second degree equations and functions. Module includes: Pre-Assessment, Introduction: Factoring, Section 1: Introduction to Polynomial Equations, Section 2: Second Degree Equations of the General Type, Section 3: Factoring Second Degree Equations with a Leading Coefficient, Section 4: Special Factorizations, Section 5: General Strategies for Factoring Polynomials, Post-Assessment. Students will Identify and solve general polynomial equations and match them to their corresponding graphs. Sections in this module: Section 1: First Degree Equations, Section 2: Second Degree Equations, Section 3: Third Degree Equations, Section 4: Onward to nth Degree Equations, Section 5: Applications.